2015 At an uncontrollable pace, life moves on , we get inevitably older and times change yet travel continues to inspire. Our family has evolved following separation, new love and a blended family. This journey will see three teenagers and their oldies venturing NZ in a modest motorhome. Our goals: to bond, to enjoy nature, to ensure everlasting beautiful memories & to have loads of fun All within a highly confined space in winter for nearly one month! 2012 Another year, another variation of our family travelling o/s- this time Ma Horner (Helen), Asher, Ni'mah & I (Terri) are heading to Malaysia mainly for the kids to catch up with their Dad who has been cycling around (up and down)the whole of Sri Lanka. They won't have seen him for 3 months. It doesn't have the same feel as other trips- the adventurous edge is missing, however, I'm sure it will be enjoyable. After nearly 3 weeks there we will part ways with Adrian- he will be flying to Taiwan with his bike while we will be enjoying the company of Judy and family in Singapore. 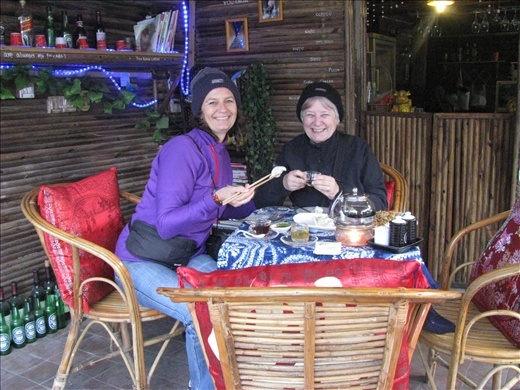 2011 This year I'm globe-trotting o/s with my Mum, Helen, for 3 1/2 weeks. Having happily resided in Hong Kong in the early 70's, Mum has been aching to get back (to witness the extraordinary changes) and I pounced at the opportunity to organise a special trip with her. We will begin our adventure across the border by the Li River and in the karst mountains of Yangshuo, Southern China as well as enjoying a stopover in Chinatown, KL for last minute shopping.